At The Petersen Automotive Museum's "Cars & Coffee"
On the last Sunday of each month, the Petersen Automotive Museum in Los Angeles hosts an informal "Cars & Coffee" get together. At a friend's suggestion, I recently brought "Klaus," my 1967 BMW 2000C - without knowing it was British (not German) car day. Ooops. So I felt like a real spoilsport (and photo-bomber) when European Car magazine named Klaus one of the Top Five cars at the show! Without a hint of schadenfreude, here are some of my favorites from the Petersen along with a few related automotive tangents as noted in italics to keep confusion to a minimum. Sandwiched between two Jaguars in the masthead image above, Klaus is rare because bimmers of this vintage are very prone to rust, and few of this model were sold in the USA. Back in '67, BMW wasn't exactly a household name, and it wasn't until the introduction of the BMW 2002 a few years later that the mark gained popularity. Klaus isn't as powerful as the larger-engined coupes that followed (including the 2800CS, 3.0CS and mighty CSL), but I prefer its unique style including glass headlamps across the nose. Given that it was British car day, there were some beautiful Austin-Healeys and Jaguars at the show, including several E-Type Coupes and Roadsters, plus XK140s and XK150s from the 50s. ...I happened upon this very grand 1957 Cadillac Eldorado Biarritz (above), which had been recently restored. 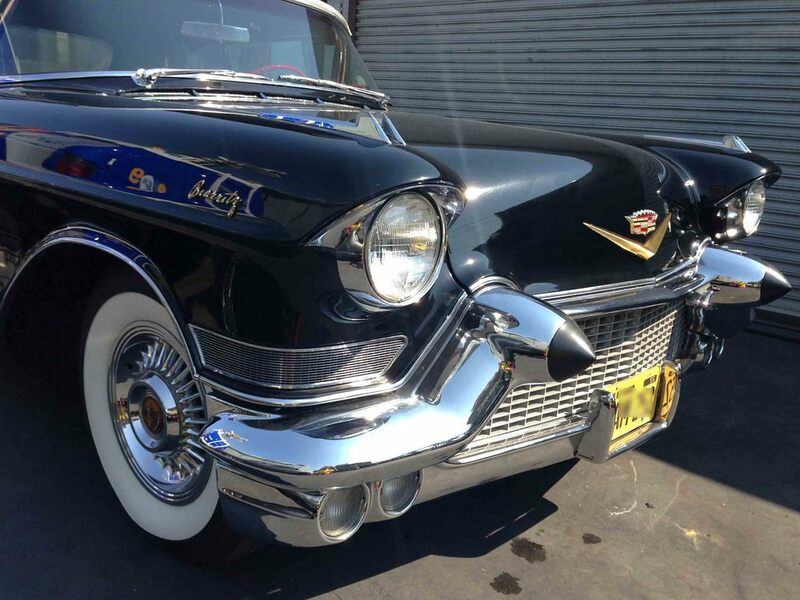 I noticed the cool, leather-wrapped sensor on the driver's side of the dashboard (right), which I learned from the garage owner is the Cadillac's "Magic Eye," which senses oncoming headlights and politely dips the Caddy's hi-beams accordingly - very impressive for 1957! USD. The 2000GT - a special convertible version, actually - was featured in the 1967 bond flick "You Only Live Twice," and the sports car manages to bring both Italian and British styling elements together with a distinctly-different Japanese flair. Last December in Paris, I saw this amazing 2000GT on display at the Toyota showroom on the Champs-Elysees (right). Parked next to the 2000GT at the Petersen was a smashing 1976 Jensen Interceptor Series III Convertible. 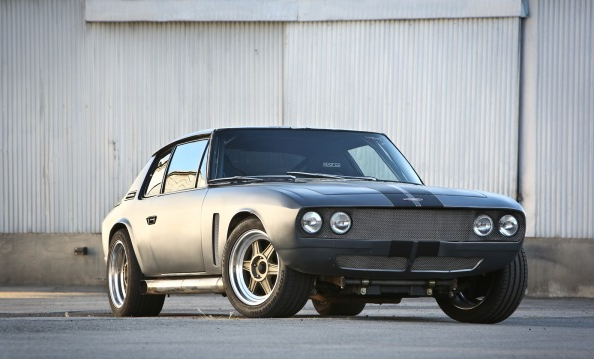 The good news about Britain's Jensen Interceptors is that mechanically, they use a Chrysler V8 engine and a dependable TorqueFlight transmission, and the bad news tends to be - the rest. 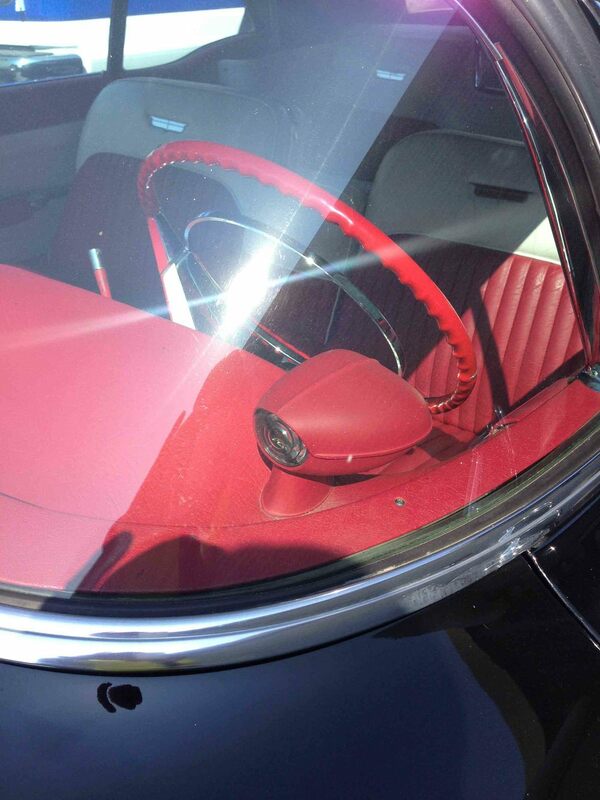 The electronics are largely by Lucas, which are also underpinnings for Jaguars of the same vintage. There's an old joke: Why do the English drink warm beer? Because they have Lucas refrigerators! A smattering of Jensen Interceptors from recent weeks, including (above) a pristine Coupe at "Cars & Coffee" in Irvine, and a fixer-upper in Los Feliz. Below, a hot rod Interceptor featured in "Fast & Furious 6"
At the Petersen, this Mercedes-Benz 500 SLC (above) looked like it was right off the showroom floor, complete with a very "Euro"-centric black velour interior which - like the rest of car - appeared brand new. 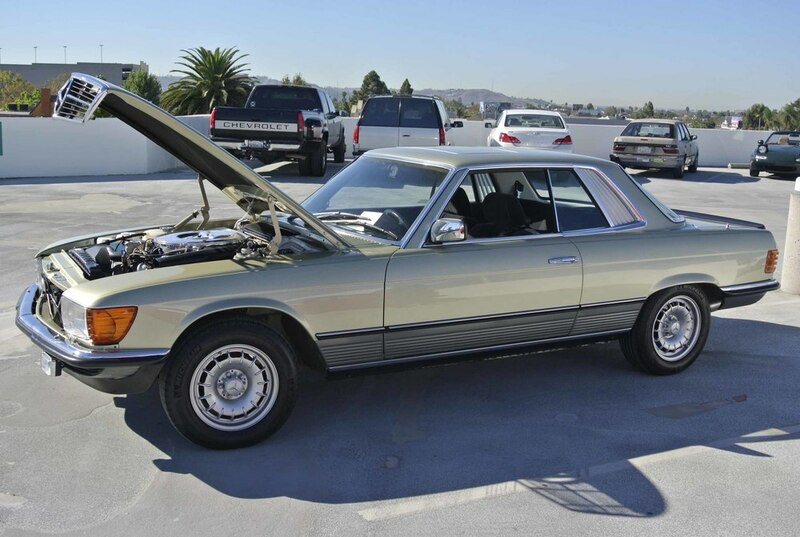 Its owner said the car was a mess when he first bought it a few years back, before restoring it with the help of the Mercedes-Benz Classic Center in Irvine. I've never seen one of these grand old coupes in such beautiful shape and I love the color. ...and earlier that week I saw this stunning 1967 Sebring, and had a chance to chat with its owner who drives his Maser regularly. A winning combination of tough and pretty, with a tailored and purposeful profile that evokes the beautiful life. At the Petersen, this Ford Lotus-Cortina (left) still has its original paint, and its owner told me that both his parents drove them while he was growing up in LA - that is until he took his father's Lotus-Cortina for a drive without permission, and got t-boned at an intersection. He rode home in the tow-truck hauling the wrecked car, and when he saw the look on his father's face through the dining room window, opted to stay in the tow truck and ride back to town rather than facing his wrath. This picture-perfect Triumph TR6 (above) somehow missed its invite to the Petersen, and was parked on Los Feliz Boulevard.